Infiniti's mid-to-full-size sedan line has been around for a few years now. Since 2011, actually. Except back then, it was known as the M, and now, it's one of the Qs. The Q70, to be exact. And despite having been around the block a while, it's still surprisingly good. 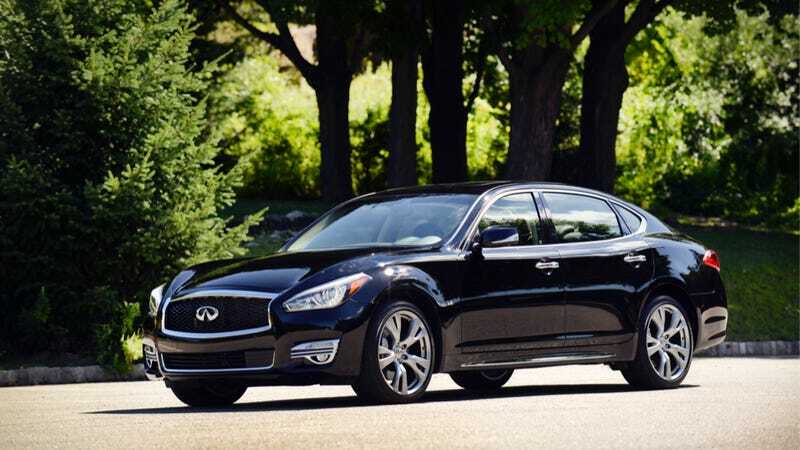 If the Infiniti Q70 above is looking familiar, that's because it is. Or rather, it should be. Or could be. No, you haven't seen a Q70 on the streets yet. Or maybe you have, sort of. Kinda. Not really? Yes? Infiniti is re-naming their entire lineup. Everything now starts with the letter Q, for some reason. And the numbers that follow the letter Q now have nothing to do with the engine displacement, as was the previous standard, but now just denominate what flavor of Infiniti you're getting. So what was previously known as either the Infiniti M37 or the Infiniti M56 is now just the Q70, which you can have with a 3.7-liter V6 or a 5.6-liter V8. Just remember, not much has actually changed under the skin with a lot of these cars, and that goes especially so for the engines under the hood. Wish as you might, the Q70 does not feature a 7.0-liter V8 upgrade over the M56. If only. So if you've seen a recent Infiniti M on the streets, just know that it's a lot like the new Q70, which isn't really very new, it just has a new name. But there is one major thing that's new, and it's not just called the "Q70." It's the Q70L, and that stands for Long. Because it is, um, longer. One word that I kept hearing the PR people bandy about the look of the new Q70 and Q70L was that the cars have "presence." I'm not really sure what that means, as that's basically like saying it has "existence," but another word definitely comes to mind when you see one of these cars on the streets. The Q70 and the Q70L aren't actually that expensive, as these things go, but they definitely look like they cost money. Not much has changed since the car originally came out, besides some bumper flattening here and there, but they're all front flares and back haunches, big shiny wheels and chrome bits, and the bullish nose up front announces its arrival. People on the sidewalk kept looking at me askance as I pulled up while driving in Manhattan, as if to say "what is this slovenly fellow doing, driving his parents' car? His father is clearly a successful accountant, and his mother is clearly a successful lawyer, and he, in his silly t-shirt, clearly borrowed it." That's the kind of look this thing elicits. And that's good, or bad, depending on what you're going for. Do you want to look like you've done well at the firm? Then sure, go for one of these. Do you want to not look like you've done well, at the firm? Well then, used Toyota Camrys go for pretty cheap these days. The stretched wheelbase in the Q70L helps, too, because all that legroom has been added to the back. It's the first car in its segment available in the United States with extra legroom, and when you see that long back window, it also screams that it punches above its weight. The only other cars with such a feature on sale right now are the big, top-level sedans like the Mercedes S-class, and the BMW 7-series. So if it's been pulled and stretched like taffy, then it's gotta be like all the other pulled-and-stretched cars, right? But instead, it's competing with cars like the BMW 5-series. And that's not such a bad thing. What you see above could reasonably be called "classy, boring, mid-level luxury, staid, Japanese, nice, interior." And you wouldn't get any argument from me whatsoever on that, taken at first glance. But where Infiniti has done especially well in recent years is on the details. The little switches and dials that fall easily to hand, and are laid out more thoughtfully than most automakers. The pattern of the leather, the swoop of the wood. All of it has some thought put into it, that just seems to elevate everything else. See? Leathery waves in the doors. That's a nice touch. See? A more natural grain to the wood. That really classes up the joint. See? Real knobs and switches! Okay, okay, so that likely is way too many buttons, which will surely lead to an inevitable crash if all you do is fiddle with them while you drive, but it's got a real volume dial. Do you know how rare that is, in modern cars?? Seriously, it's a real treat. But the biggest treat is definitely in the back of the Q70L. At 5.9 inches longer than the standard version, it's got plenty of legroom, if you're very tall and being chauffeured around in the back, and you care about that sort of thing. They're heated, too. The front passenger could probably even recline a bit without you trying to murder their face off, airplane-style. The Infiniti Q70 comes with your choice of Nissan's venerable 3.7-liter "VQ" six-cylinder engine, which has 330 horses in this guise. And that, surprisingly, makes it fun. I say "surprisingly" mostly because the Q70 feels, in short, enormous. Not "enormous," like sluggish and slow, but more in a way that you're constantly aware of how far away the hood is, as the front arches constantly remind, or how wide the back is. Everything else on the road, in turn, feels a little bit closer to you. It's an odd feeling at first, especially if you're coming from the similarly-sized-on-paper BMW 5-series or Audi A6, but when you step on the throttle, it seems to melt away. In Sport Mode, the V6 turns from easy cruiser to eager beaver, and the shifts from the paddle shifters get sharp and crisp, switching up the ratios right when you want them to. Hit the brakes, and it'll hold onto gears just a little bit longer, almost as it were asking you to put the power back on. The steering stiffens up a bit as well, making you more confident on turn-in as you go. With the 5.6-liter, 416 horse V8, everything simply becomes effortless. Wave your foot in the general vicinity of the throttle, and the big eight-cylinder mill starts churning you forward, at speeds you wouldn't think is appropriate for an Infiniti. But here's the catch. The weirdness, if you will. Whereas Sport Mode is great, wonderful, everything a Sport Mode should be, the Eco Mode is its evil twin, to enthusiasts. In both the V6 and the V8, Eco Mode isn't just some button you push to make a little green leaf pop up on the dash. Eco Mode is real. And it's here to make you save money on gas. The throttle response is completely switched up from Sport Mode. It really is a drastic change, as you slowly bury your foot in the throttle and nothing seems to happen. If you pin the accelerator to the floor, yeah, you'll get full power, but it's almost like you won't go very far very quickly with Eco Mode on. Try to push too hard, and the accelerator pedal will actually push back on your foot, begging you to stop. But Eco Mode really isn't the Devil himself. To be honest, I'd rather have an Eco Mode that actually does something, and in this case, it does it well. You will definitely be feeling the difference here. And if you do let your slovenly teen get behind the wheel, you might want to glue it there. As befitting any self-respecting large Japanese sedan, it's got plenty of beeps and boops to keep you happy. Blind spot intervention, blind spot warning, Active Trace Control (which is kind of like automatic trail braking when you throw it into a corner to help you turn sharper), a slight four-wheel steering effect, radar-guided cruise control, a lane-keeping assist system, predictive collision warning system, active noise cancellation, Bose sound system, an emergency stop warning system, a backup cross-traffic warning system, and seat belts that increase the tension on themselves automatically with a little electric motor, which is a strange intrusion at first, but which you quickly get used to, are all available on the Q70. And that neat little overhead-view camera thing, which is a gimmick I am totally in love with. It is definitely loaded up to bear with a lot of tech. The only thing it's missing might be a HUD. I've been prattling on and on about how it looks expensive, drives pretty well, is loaded with technology, comes in a long-wheelbase model, and on and on and on. You probably think this starts at somewhere around $75,000, but it doesn't. A bone-standard Q70 starts at just $49,850. And if you want that extra legroom in the back, it'll only bump you up to $51,350. And for a big, long-wheelbase sedan, that's basically a steal. Even with the $3,000 technology package tacked on, it's not exactly terrible. Okay, so the monster V8 version with all wheel drive will bump you to over $67,000, but it's not really necessary. Hand me a Q70L 3.7 any day of the week, and I'd be a happy camper. Even if the car isn't as new as they want you to think it is.